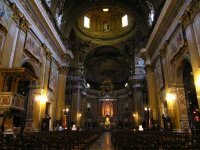 ... AND I LET MYSELF BE DUPED: How Many Priests Does It Take . . .
How Many Priests Does It Take . . .
Another view of New Orleans Province Jesuit Joseph Carola (center) in Rome. No, this is not Joey and his priest friends being arrested (hands against the wall!). But what are they doing? Give us your guess before learning the truth over at The Roamin' Roman. They are measuring if there is space to put an altar somewhere. 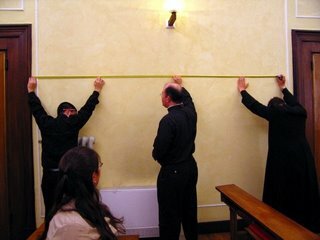 The only problem is I think they'd be measuring for a pre-V2 altar... Then again what do I know I'm Lutheran! They're measuring a spaced for the medieval rack, which will be used to torture Lutherans, Dominicans, and other dissenters once the Jesuits successfully take over all Vatican dicasteries. Measuring for a chair rail for a REALLY TALL throne? Measuring to hang a picture of "pope Joan"? You must be this tall to ride the Vatican roller coaster! They're trying to figure out what size plasma TV to buy? I say they are measuring for a cassock rack. P.S. A cassock-wearing Jesuit they call Joey? My head, she is swimming! Has The Priory of Sion Kidnapped Amy Welborn? Oh, the Pain of Writing . . .
Must Be Frackin' SciFi Friday . . .